The ESTfield is a Lotus 7 replica essentially similar to Colin Chapman's 1957 design. The chassis dimensions are based loosely on those given by Ron Champion in his book "Build Your Own Sports Car for 250 Pounds". The tubular spaceframe chassis , be it steel or aluminium, is what makes a "Seven"; the drivetrain and outer body panels are more a question of taste and personal preference. We at RaceTech have chosen the well proven and rugged Lada as the principal donor vehicle for the ESTfield. This means that in the majority of cases Lada forged front uprights and 98mm PCD hubs, shortened steering arms, and Lada disc brakes are used at the front, and the Lada live rear axle and drum brakes are used at the back. However, Volvo front and rear axle components are also used where weight and power output demand it. Choice of engine and gearbox is left to the customer. So far, Audi, VW, Alfa Romeo, Toyota, BMW, Moskvits, Nissan, Ford, Volvo, Chevrolet, and Lada engines have successfully been fitted. Customers can choose between three kits that all contain our professionally welded chassis adapted to suit the chosen drivetrain. All additional suspension components, body panels in GRP and aluminium, and all other trim and accessories to finish the car are manufactured or supplied by RaceTech. Alternatively, RaceTech can also part or fully assemble cars, as required. RaceTech Ltd is based in Tartu, a university town with a population of 110 000 in the south of Estonia, and has been manufacturing spares and accessories for racing karts and offering engineering subcontract services in Estonia and Scandinavia since 1992. In 1999 RaceTech's owner/manager, Valter Teppan, made several trips to England with his son Indrek who was receiving racing driver tuition. In England the very competitive and relatively low-cost racing series using Lotus 7 type cars caught Valter's eye, and, after consulting with Ron Champion, the author of the locost idea, he decided to begin the task of introducing these cars to Estonia. It soon became obvious that the best way to do this was to harness the know-how and skilled workforce he had built up at RaceTech. The first prototype, an Audi engined model, was completed in the year 2000 and was on show at the Estonian motor show in 2001. 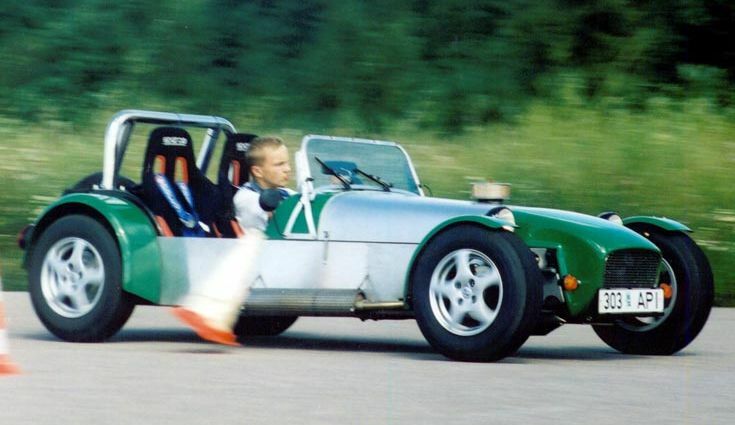 In the summer of 2003 there were 15 complete ESTfields in Estonia (13 of them registered), 3 finished and 13 part-finished cars in Sweden, 3 finished and 2 part-finished cars in Latvia, and orders for at least 36 more. Now at the end of 2003 the number of manufactured chassis has risen to 78. The number of finished cars in Estonia meant that it was possible to start up an ESTfield race series in 2002 - see our racing page for more news. Now, as the next step, RaceTech has also begun to manufacture aluminium chassis. As more cars are built a s/h market is also developing for finished and part-finished cars - see our For Sale page for more details.